What exactly is the distinction between play and work? The things some people do for recreation would seem like bloody hard work to others.I’ve spent a good part of my life climbing mountains and rafting rivers, and a good part of my life learning science, but I’ve never made much money at these. More practical work has served very well that I may enjoy adventure and science, but for me adventure and science are the same. How can a climber not be at some level a geologist? 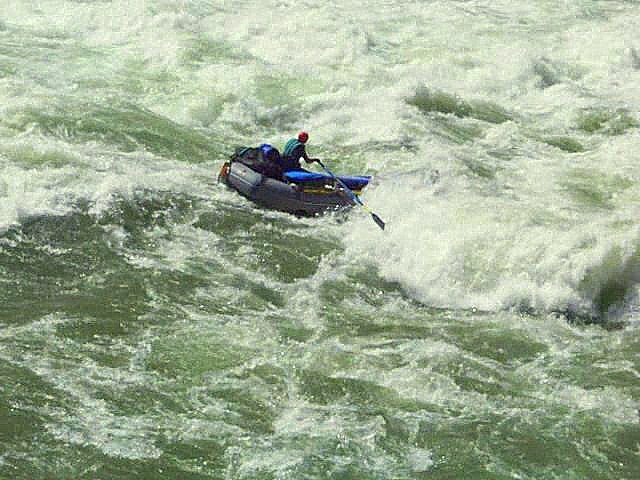 How can a rafter not be a hydrologist? Here I’m bouncing off a reaction wave in an unconventional entrance to Lava Falls on the Colorado River in the Grand Canyon. The more developed part of the cyclical wave where my oar is would flip the boat if encountered broadside. Beyond and out of view is the famed V wave one must hit straight and at the point. Well, I hit the reaction wave hard and as I’d hoped it bounced me into good position for the V wave. The loss of momentum cost me some style points further down as I got spun, but when you get to the bottom of Lava right side up you’ve had a good run. I believe that emergent properties insure that life will never be reduced to chemistry, and I suspect that similar properties will prevent the fluid dynamics of Lava Falls from being mathematically modelled in my lifetime. So study all the math you can, but to really understand water you must float a river. This entry was posted in River and tagged Colorado River, Grand Canyon, Lava Falls. Bookmark the permalink.